Sony’s robotic pup Aibo gives new meaning to the term newshound. In its latest evolution Aibo ERS-7M3/T has the ability for short-term memory mapping and news reads through a version of web syndication– RSS (Really Simple Syndication) feeds. “With one simple voice command Aibo can read the morning’s headline news while its owner folds the laundry,” said Toshi Kawai, senior manager of Entertainment Robot America (ERA), a division of Sony Electronics in a prepared statement. The AIBO Net News reader capability enables the robot to read its owner news or weather from a choice of RSS feeds available on many websites. Puppy also comes loaded with the AIBO Diary in case owners want to know what he is up to while they are out of the house. 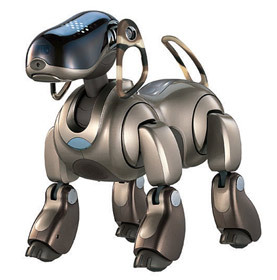 Aibo can take pictures and add notes on its daily activities to its diary. (Yes but what if he’s lying?) The diary can be shared by uploading entries directly to a blog site. The dog has its own blog now. Bring on the apocalypse. ERS-7M3 — bundled with AIBO MIND 3 software — enables Aibo to say more than 1,000 English word plus -– Dios Mio! — Spanish for the first time. He’s a multi-lingual canine now with around 30 Spanish words and phrases in his circuits, including sientate (sit down) ven aqui (come here) and buen perro (good dog). The new software comes bundled with any of the new ERS-7M3 models. Current Aibo owners can purchase upgrade kits for previous ERS-7 models. A limited-edition champagne brown Aibo Entertainment Robot (ERS-7M3/T) will come with a camouflaged ear, along with a tail design that is unique to each unit. The champagne brown Aibo Entertainment Robot model ERS-7M3/T will sell for about $2,100. The pearl white and pearl black models (ERS-7M3/W and ERS-7M3/B, respectively) will both sell for about $2,000, shipping in late October.